Checkout our web products below. Listed by Department, browsing for what you need is easy! Get your Domain here & get the world for free! When you get your Domain at Webs-a-gogo, we'll help you take around the world and back. A Fast & Easy to use management interface together with tools and our personal tech support will make your trip complete. Websites that mean Business and sites that get real personal! Webs-a-gogo has everything you need for a website. Whether you need a professional image and functionality to go with your business, or a personal site to go with your style. 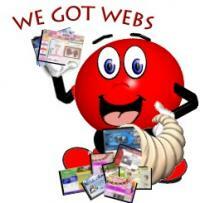 Webs-a-gogo is the perfect home on the web! With a wide range of services and hosting packages we can custom fit almost any need. Choose from one of our pre-fab WAG-PAC's or assemble your own. Get an SSL certificate for your site to let your customers know you are legit. Protect your name and site content from copycats and worse with your WAG-PAC options. This is short sub-title to the Department title. This is where you can write a paragraph about the department. You also can put a picture with it. Any Categories associated with this department will appear below as links.